Duckling stories don’t always have a happy ending, but every now and then rescuer, ducklings and mother duck, get lucky. A case in point involved a Pacific Black Duck and her ten ducklings, all born on the third floor balcony of a major city hotel. Not a good place to be born! Ducklings can’t fly of course, and they can’t take the elevator down, but somehow these birds had to get to ground level. Mother ducks instinctively know this and will push offspring from great heights and let them drop. Being soft and fluffy ducklings are designed to bounce and land safely, even when pushed from three stories up (I once rescued a family of ducks from the eighteenth floor of a hotel). Most survive if they land on grass, but the concrete concourse of this city hotel would be a hard landing indeed. Even if the ducklings did survive the drop there was nowhere safe for them to go. The valets in the driveway had been collecting falling ducklings all morning. Each time they’d take them back up to the third floor balcony where their mum would push them over the edge again. Tough life being a duckling in the city! The staff realised this couldn’t go on and called for help. I instructed the staff to collect the ducklings and put them in a box. By the time I arrived they’d collected all ten. That was the easy part. The problem was in catching mum. Ducklings are easy to catch but wild ducks are extremely fast. If I could catch her it meant the whole family could be released somewhere safe. If not she’d lose her kids and they’d go into foster care for 10 weeks until fully grown. That was not the ideal outcome. The staff said the mother duck hadn’t been seen for half an hour. Eventually we found her – in the swimming pool on the third floor. The plan was to use the ducklings to lure her out of the water. I placed the box containing the ducklings in a small ornamental garden bed by the pool, hoping their quacking would get her attention and provide a chance to net her. Swimmers were starting to take notice. Catching a wild duck with a hand net is nigh on impossible, unless the bird is badly injured or drunk – preferably both. 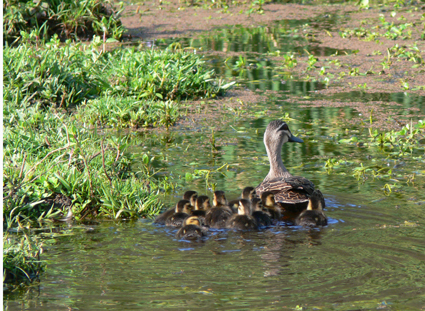 Mother ducks are usually easier to approach because they have a protective bond with their kids. Despite my best attempts I missed her twice. Once is bad enough – twice and it’s all over. The duck became wary and retreated to the pool. She couldn’t be coaxed out. The situation was looking bleak. I had to come up with a new plan. After some thought I took the ducklings down in the elevator and then crossed the street to a tiny park, not far from the hotel. At the front of the park was an aluminium bus shelter. I stood inside holding the box, hoping the shelter would amplify their quacking. I waited and waited, giving the box a gentle tap every now and then to make the ducklings call louder. It took a while but eventually she heard their cries and cautiously peered down from the third floor balcony. Then she flew down to the park – just what I’d hoped for. I quickly released the ducklings and all ten rushed to their mother. Then I realised my mistake. The park was tiny and bounded on all sides by heavy traffic. I hadn’t thought this out. There just wasn’t enough space. To make matters worse it was Sunday and kids playing in the park were excited to see the ducklings. With all the attention the family was being driven out and onto a busy road. Fortunately other adults could see the crisis unfolding and ran over to help. I asked them to keep the kids away so the mother and ducklings would stay in the park. She was being extraordinarily loyal and had remained with her brood, but I knew it was only a matter of time before stress overwhelmed her and she would bail. My next shot with the net had to count. We gently herded the family towards a small garden bed. As the mother duck stepped behind a shrub and momentarily lost sight of me I seized the opportunity and took the shot. I got her. What followed was a wild treasure hunt as several adults and a dozen children scrambled to catch the ducklings as they took refuge amongst the bushes. Soon we had them all. Minutes later the whole family had been transported to a safe area. I released mum and the kids onto a calm lake with abundant weed growth. A happy ending for all.